Design: Give us some idea of the spindle design. Email a picture for a more accurate quote. Should I have custom porch balusters made, or choose one of your standard designs? We offer many traditional spindle/baluster designs in several common sizes and lengths, and in both Wood and Synthetic. Our designs are reminiscent of popular architectural choices, and if you’re building a new porch, our standard designs will give your project the clean lines and distinguished appearance that a Victorian-era porch should have. For most of our customers, one of our several standard spindle design styles will work very well. But many of our customers want to refurbish their existing porch with new spindles/baluster, but want to retain the old design. This is not only possible, but is our specialty. Having your spindles replicated by American Porch is a great way to preserve your home’s look. The cost difference when made in Cedar is usually minimal: generally, custom porch spindles / balusters cost only about 15% more each than one of our standard design spindles of the same size. We run high volume equipment that efficiently produces large quantities, but takes some time and money to setup. A small fee is passed on to the customer for smaller orders, but is waived on larger runs. If you’d like to switch to our synthetic Polyurethane alternative, we can do that too. Choose one of our standard designs, or have your original reproduced. There is some extra costs involved with custom Poly spindles because they require the manufacture of a custom mold and associated tooling. Just send us a picture, dimensions, and quantity and let us quote your project. Keep in mind that once we’ve made your design, we can reproduce an unlimited number of perfect reproductions. If you need to order more of the same custom spindle later, it’s no problem. We keep your design on file and can produce as many as you need. As with our standard designs, ordering spindles/balusters in larger quantities does qualify customers for a quantity discounts. We create exact replicas of your spindle/baluster design. In order for us to do this, send one original to our shop so we can create your custom design. If “close” is good enough, all we need from you are a few clear digital pictures and corresponding measurements. As always, please feel free to email or call with questions. We look forward to helping you with your dream porch! This Charlotte, NC custom wood porch spindle restoration is a common example of what we do every day. Step 1: the customer sent us a picture, dimensions, & quantity. Step 2: We replied with a quote. Step 3: The customer sent us an original for us to reproduce. In a couple weeks, the customer had custom-made replacement porch spindles at the jobsite and ready to install. 3×20″ custom Redwood spindle restoration. Spindle Restoration in Canfield, OH: This customer was only replacing about half of the wooden spindles on his porch and therefore needed an exact replica. He picked the best remaining spindle from his porch to be replaced so we had a good template to go by. The result: an exact replica of his original wood spindles. They are 3 15/16″ x 14 1/2″ net custom turned porch spindles. Check out this completed project on our PORCH GALLERY page. Purchase these on our ONLINE STORE. 3×24″ custom turned porch spindle restoration made with Cedar for a project in Paola, KS. The original wood spindles were in very rough shape. Both the customer and our guys did some doctoring to get this spindle to the point where it could be copied. 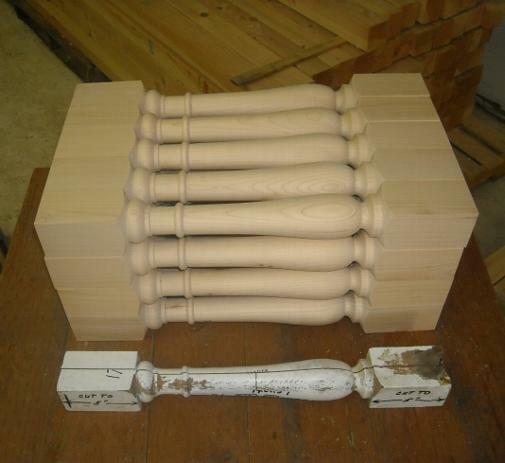 Once that was done, we are able to make an unlimited number of replica spindles (or balusters). A custom porch job in Beach Haven, NJ. This customer wanted wood spindles in two different lengths: taller ones that could be fitted to a curved “goose neck” easing, and shorter ones for the straight sections of rail. Also, note the bottom notching for use on a sloped-top bottom rail. One of the boxes of the shorter spindles. All ready to ship! Again, note the bottom notching for use on a sloped-top bottom rail. Note the use of our premium, solid clear Cedar. It is the strongest of all cedars, which means it looks better, lasts longer, machines to a finer finish than any other. A restoration project in Farmington, NY. Because this house was “grandfathered”, they had the luxury of using the original short spindles for an exact reproduction. Another porch spindle restoration project that was “grandfathered” and therefore able to use original size 4×17″ spindles. This one is in Greensboro, GA. The homeowner wanted to spread the cost out over time and is replacing only the most rotted ones a dozen or so at a time. The spindles on the right side are the new ones. The ones on the left are the original 120 year-old spindles. For convenience and financial reasons,this homeowner decided to replace only the spindles with the most damage.Once we have a design made, an unlimited number of perfect reproductions can be made. So whether you are doing your project in stages like this one, or you want to add a back entry rail to match the porch rail you installed last year, your design will always be on file here and ready to go. Another Victorian Porch Restoration, this one in Montgomery, AL. For an exact reproduction, this customer needed a 2 1/4″ net wood spindle width. Although this is not a stock size, we simply milled larger stock down to match the dimension. In this way, we can create any size you need. Cedar was used because it’s strength, durability, and it’s natural rot and insect resistance. This premium outdoor wood contains an oil that is toxic to insects and mold which means these spindles will look great for generations. More examples of wood porch spindle restoration work. A 2×7″ custom Cedar accent spindle restoration for a house in Bozeman, MT. Can you find the original? Next time you’re in Brooklyn, NY, keep an eye out for this front entry restoration. This homeowner wanted the wood spindles slightly thinner than the originals, and needed some new balltop finials for the existing newels (newels not shown here). We were able to match the massive 7″ diameter finials and therefore keep the original character of the entryway. 2×15″ table leg restoration and modification. Oddly enough, the original wooden spindle came off a railing on an old boat damaged by hurricane Katrina. This customer liked the design and wanted his coffee table to reflect the style of his old boat. We can help you make the indoors OR outdoors your own. K.S. of Ridgewood, NJ writes “We are sooooo pleased with how this came out and the fact that we were able to recreate the old unique look of the porch. Thank you! The materials did show up on time, in good condition and most certainly met my expectations. Western Spindle duplicated these balusters to exact measurements. I’m very pleased with the quality and workmanship of these balusters. I would highly recommend Western Spindle to anyone looking for quality custom porch products, great customer service and in the end, customer satisfaction. The attached photo shows a small section of my covered porch where several balusters were replaced. Should I need any additional custom porch products, I will be in touch to place another order! “The spindles were great. We have a home in Boston, (around 1900s) and needed to replace some spindles on the front porch. Yours matched perfectly. As you can see from the pictures, once painted, you can’t tell the new from the old! “Western Spindle is a great company. I searched for some unique and authentic railings, spindles, balusters, columns, bases and capitals for a historic remodel project and there are very few options out their to match. I especially appreciated their custom match option.We appreciate their expertise and professionalism.